Imagine for a moment that you are Maria. Maria was driving through an intersection when her car was struck by another vehicle. Maria suffered several severe injuries that required a significant amount of medical treatment. However, Maria’s insurance company would only cover a portion of her medical treatment costs. Maria was at a loss for what to do, when someone told her to talk to a reputable personal injury law firm that might be able to help her. She was hesitant, thinking that filing a law suit might make create additional problems for her during what was already a very stressful and expensive time, but by choosing Lawrence & Associates, she realized she would not have to pay up front for her personal injury case! Her Lawrence & Associates personal injury attorney explained to her that her personal injury case would operate on a contingency fee, meaning that she would not have to pay any attorney’s fees or case expenses unless she won her case. Although Maria still had plenty of questions, her personal injury attorney was happy to answer them. The most important question for her, and maybe for you if you find yourself in a similar situation, was how much money she could expect to receive and when she would receive it. How does a Greater Cincinnati area lawyer calculate or estimate how much money I get from my personal injury claim? The first thing for you and your personal injury attorney to consider (because you are a large part of the settlement process!) is what a reasonable sum of money for you to give up your legal claim looks like. This varies from person to person, from situation to situation, depending on circumstances. Most insurance companies use mathematical formulas to calculate the amount of money they are willing to let go in the settlement, and your personal injury attorney will look at this formulaic process on the other side during the negotiations process. This is true regardless of what type of personal injury case you are bringing forward. This formula does not actually determine how much compensation someone receives, however. It is more of a tool that insurance adjusters use to begin the process of determining how much a claim is worth. Other factors must be considered before a final determination about compensation is made. Once the settlement formula is applied, the insurance company will look at other legal and practical issues that affect your case. Some of these issues could include whether there is any shared fault for the accident, how organized and calm your demeanor is in relation to the claims and settlement process, whether the other side is credible or sympathetic, and any witnesses that may bolster your case. Because there are so many factors that go into how much your case will settle for, it is dangerous for attorneys to promise a high dollar settlement amount to their clients. Attorneys are held to very stringent ethical standards, especially regarding the handling of money and the representation of clients. Do not be afraid to check out your potential attorney on the state bar association’s website where the attorney is located to see if there are any ethical complaints or malpractice suits filed against them. What is the damages formula and how does it work? It is important to have a damages formula because, while it is usually fairly simple to add up money spent and money lost, there is not a precise way to put a dollar amount onto pain and suffering and missed or lost opportunities. The latter is what the damages formula calculates. The person found liable for an accident must pay the victim for medical care and its related expenses, missed work and other lost income, pain and other physical suffering, permanent physical disability or disfigurement, loss of family, social, and educational experiences, and emotional damages resulting from any of these losses. To begin the original offer, an insurance adjuster will add up the total medical expenses relating to the injury, which are referred to as “medical special damages” or “specials.” To figure out how much to pay for emotional damages, permanent disability, and pain and suffering, which together are referred to as “general damages,” the insurance adjuster typically multiplies the amount of special damages times one-and-a-half to three times for relatively minor injuries and up to five times for especially painful, serious, or long-lasting injuries. Any lost income is then added to this number. This is usually the number where settlement negotiations with your personal injury attorney begin. Two important things to remember about the damages formula are that, first of all, the figure arrived at is only the starting point for negotiations toward a final settlement amount. Other important factors about your accident and your injuries come into play as well. Secondly, because the starting formula can have a multiplier anywhere from one-and-a-half to five, or possibly even higher, considerably different numbers can be produced depending on where your case falls on the multiplier scale. Factors that influence where your case falls on the multiplier scale can include how painful your injury is, how invasive and long-lasting your medical treatment was, how obvious your medical evidence is, how long your recovery period is, and how serious and visible the permanent effects of your injury are. Sometimes, your target settlement needs to be adjusted for your own fault. Kentucky is a pure comparative negligence state, meaning that the dollar amount of your award is reduced by your percentage of fault with no limits. Ohio is a modified comparative negligence state, meaning that your award is reduced by your percentage of your fault, and if your own fault is greater than fifty percent, you cannot win any damages, so the settlement value of your case is much less than your actual damages. The last factor an insurance company looks at is whether you have retained a competent attorney. Injured people who have not retained counsel are often looked at as “not serious” about pushing the value of their claim, or unable to successfully push the value of their claim once litigation becomes necessary. This theory often bears true, because unrepresented injury car accident victims don’t know how to file and pursue a lawsuit in court. This means those unrepresented people are stuck with whatever the insurance company decides the value of the case ought to be, not what the injured person or a jury of his or her peers decides the value of the case ought to be. This is the reason that getting counsel as early as possible is important. If you are overwhelmed by your personal injury accident, contact Lawrence & Associates today. We can help you navigate through settling with your insurance company to get you the award you deserve! Call today for a free consultation at (859)371.5997. We’re Working Hard for the Working Class, and we want to help you! The following article was written by William Doering, a former law clerk at Lawrence and Associates. Doering is currently a student at Chase Law and pursuing a Juris Doctorate. Personal injury cases happen all the time. Most are run-of-the-mill in terms liability and damages. However, there are always extraneous circumstances where damages can be more complex. Each individual plaintiff will require a different amount and type of damages depending on the facts of the accident and the plaintiff’s life circumstances. After accidents, plaintiffs are concerned with being able to do the activities that they were able to do before the accident. Plaintiffs who are no longer able to do certain activities following a personal injury accident may be compensated for that loss. For many, playing sports is an activity that plaintiffs lose the ability to do after an accident. Suppose for instance that you are an athlete who has just been in a motor vehicle accident. The injury caused by the negligent third party has left you unable to play your respective sport. Damages are proper to help pay for the value of your damaged vehicle, your medical bills, and future treatment. However, you also have the ability to claim damages for being unable to play sports in the form of loss of enjoyment of life. We’ve previously written about damages on several occasions. This blog will describe the basics of personal injury damages, explain the purpose and function of loss of enjoyment of life damages, then describe damages for pro and semi-pro sports players, and discuss how to claim these damages in a tort lawsuit in both Kentucky and Ohio. What Kinds of Damages Are Allowed in Kentucky and Ohio? In all successful tort claims, plaintiffs will be able to claim compensatory damages. These can be either general damages or special damages. The American Jurisprudence defines general damages as “those that are the natural and necessary result of the wrongful act or omission asserted” in the complaint. These damages compensate the plaintiff for any loss, injury, or damage such as property damage or medical bills resulting from an accident. Special damages, sometimes called hedonic damages, are another form of compensatory damages. These damages encompass “damages for a harm other than one for which general damages were given.” Special damages can include expenses like loss of enjoyment of life, loss of consortium, pain and suffering, lost wages, mileage, or lost profits. When claiming special damages, plaintiff must show that they received a great deal of bodily harm; past what general damages can cover. Special damages are calculated separately from one another depending on the jurisdiction; i.e. loss of enjoyment of life will be judged as a separate and distinct category of damages from pain and suffering. Kentucky does not recognize loss of enjoyment damages as a separate claim. However, loss of enjoyment damages may be considered as evidence in determining the severity of injuries, general damages, or pain and suffering. In limited circumstances, Ohio does see loss of enjoyment damages as a separate claim. The reasoning is that Ohio courts see loss of enjoyment damages as a loss of positive experiences rather than an infliction of negative experiences. In calculating loss of enjoyment damages, Ohio limits recovery to circumstances of the injury that were not already addressed in the general damages. This ensures that there are no excess damages awarded to the plaintiff. What Special Damages Do Kentucky and Ohio Allow Professional Athletes to Claim? Claiming damages for inability to enjoy sports requires a showing that the harm suffered resulted in a “loss of ability to engage in sports or recreational activities, … loss of a desired vocation or avocation, loss of use of a limb, … or miscellaneous losses” as the court deems fit. A plaintiff must have “developed the ability to perform a pleasurable activity or hobby specifically identified to his or her lifestyle.” There must be an adequate showing that the plaintiff regularly participated in and enjoyed the activities which they can no longer do because of the injury suffered. If the plaintiff is an athlete with potential to play college, semi-professional, or professional sports, that factor is taken into consideration. However, this type of predictive futures damage is harder to prove. Courts err on the side of caution before awarding these damages because they must be a precise as possible. Not every person injured in a car accident will make it to the pros. Thus, not all plaintiffs should be able to claim these extra damages for potential lost financial damages. Courts will only rule in favor of extra damages in this manner if an athlete was already playing sports at a higher level or if they were certain to play them and have some form of monetary gain from playing them in the near future. Loss of enjoyment damages are real damages that can be claimed from a personal injury accident. Courts in Kentucky and Ohio allow for them to be claimed following an injury; they are just argued differently. If you have been injured due to someone else’s negligence and can no longer enjoy playing sports, you can be compensated for this loss of enjoyment. Make sure to talk to a legal professional about your options if you think you can claim these damages. The legal system may not get you back to playing sports again but it can fairly compensate you for the loss of those positive experiences in life. Are you a pro or semi-pro athlete that has been injured in an automobile accident or as a result of someone else’s negligence? Don’t go it alone! Lawrence & Associates has helped thousands of people recover for their injuries, and we know how to fully recover for your damages. We’re Working Hard for the Working Class, and we want to help you! By now, everyone is familiar with the tragic accident that took the lives of Rodney Pollitt, Samantha Malohn, and their three children. Because this firm represented Mr. Pollitt and several members of Ms. Malohn’s family in the past, the news hit us especially hard. When lawyers are at their best, they seek justice. In one way, justice is already coming for the man that caused this tragedy. Kenton County Commonwealth Attorney Rob Sanders will charge the other driver with five counts of murder for his role in the collision. That is criminal justice, but Lawrence & Associates is in the business of civil justice. The civil justice system is the process of suing for money. That can be a lawsuit over injuries or deaths, such as what happened to the Pollitt family, or business suing each other over contracts, or many other things. There are a few forms of civil justice that might apply to the tragic deaths of the Pollitt family. First and most obvious, the driver of the other vehicle probably had automobile insurance that would cover the accident, although that might be as small as $25,000.00, the state minimum limit. Second, the Pollitt family’s car insurance should provide coverage, in the form of Uninsured Motorist Coverage if the other driver didn’t have insurance, or Underinsured Motorist Coverage if the other driver just didn’t have enough insurance. Third, and less obvious, a qualified law firm would do a complete background check of the other driver to find out whether he had any other insurance coverage that would cover the collision. For example, many people with high paying jobs or lots of assets will get an “Umbrella” policy that will provide another million dollars of coverage (or more) in the event of tragic losses. Uninsured, underinsured, and umbrella policies are where many people make mistakes when they try to handle their own insurance claims. If the family is too quick to sign off on the first $25,000.00 in coverage, they may accidentally waive their right to any additional insurance coverage. In addition to the insurance for the at-fault driver and the deceased family, a good law firm needs to look into a Dram Shop claim against the golf course where the at-fault driver was allegedly drinking before the collision. A dram shop claim arises whenever a bar or similar business sells alcohol to a visibly intoxicated person, or to a minor. At this time, news reports have not covered this possibility, and so we don’t know whether the golf course might be liable under the dram shop laws. But given the scope of this tragedy, the possibility should be investigated. Finally, an accident investigator should pull the black box from the at-fault driver’s car and inspect all the major mechanical systems. Almost all newer model cars now have a (black box [https://www.merriam-webster.com/dictionary/black%20box]), which records all the driving data up to the point of a collision. It will tell speed, whether the brakes were hit, how the steering wheel was turned, etc. There is always an outside chance that the at-fault driver’s car had some malfunction that prevented him from steering or braking. If so, that doesn’t necessarily absolve the at-fault driver from liability, but it could lead to additional liability for the car manufacturer, or anyone that had recently worked on the mechanical system that failed. Both criminal and civil justice are important, and Lawrence & Associates hopes the surviving members of the Pollitt family get full justice through the American Courts of Law. The following post is part of our Law Student Blog Writing Project, and is authored by Raphael Jackson, a law student from the Chase School of Law. Being involved in an automobile accident can be a trying experience. Even long after the accident, negotiating with insurance providers is often a major source of stress for either party involved. Given the stress of the situation it is a common temptation for the insured to agree to a quick settlement, regardless of how unfavorable it might be, simply for the sake of moving forward. In order to prevent such a situation, it is important to be fully informed of your rights and responsibilities, as well as the rights and responsibilities of all parties involved. According to a 2014 study conducted by the Insurance Research Council, one in eight drivers in the United States are uninsured. In the Commonwealth of Kentucky, nearly 16% of all motorists are uninsured. In the state of Ohio, the number of uninsured drivers is approaching 14%. This means that if you are injured in an automobile accident in Kentucky or Ohio, you run a 14% and 16% chance, respectively, of having to deal with a party who is uninsured. In order to protect themselves from such a scenario, many drivers purchase Uninsured Motorist coverage (UM). UM is offered as a standard on every insurance policy. It can, however, be waived by request. Another scenario you may experience is being involved in an accident with a driver who has insurance but doesn’t have enough insurance to cover the property damage or personal injury caused to themselves or others. This category of insured drivers is commonly known as underinsured motorist coverage, or (UIM). Whenever a claimant makes a claim against her own insurance this is also known as a first party insurance claim. Remember this important difference: both an uninsured claim and an underinsured claim are claims made against your own insurance policy, but an uninsured claim is made when the at-fault driver had no insurance, while an underinsured claim is made when the at-fault driver didn’t have enough insurance. Some states require insurance companies to compensate the injured for medical expenses and/or lost wages regardless of who was at fault in the accident. States which enforce this regulation are known as no-fault states. Other states follow an insurance arrangement in which one party is assigned most of the blame of the accident. The party to which the blame was assigned is then legally liable for the damages. This is known as a tort system. Ohio follows the tort system, which operates on the theory of comparative negligence. Comparative Negligence, for insurance recovery purposes, means that if one party is more than 50% responsible for the accident then that party is not entitled to damages. If you are involved in an automobile accident in Kentucky, you are not required to prove that the other driver was at fault in order for you to be compensated by your insurance company. In no fault states the portion of the insurance that covers the expenses is known as Personal Injury Protection or PIP. PIP covers motorists and pedestrians injured by motorists. Fault notwithstanding, basic PIP in Kentucky provides up to $10,000 per person per accident, for any “out of pocket” costs due to an injury. Any insurance policy that you purchase in Kentucky automatically comes with PIP coverage. Thus, all insured motor vehicles in Kentucky are required to have basic PIP coverage. Ohio does not directly require a motorist to purchase automobile insurance, however Ohio requires all drivers to have “proof of financial responsibility,” which proves that they can pay for injuries or damages to others if they cause a car accident. Proof of financial responsibility can be, and is typically satisfied when the motorist purchases the minimally required Bodily Injury Liability coverage and Property Damage Liability coverage. The minimum bodily injury coverage in Ohio is $25,000 per injured, per accident, and $50,000 for all persons injured in any one accident. The required minimum for Property Damage Liability coverage is $25,000. In the event that the damage exceeds the minimum insurance coverage you can be held personally, legally responsible for any amount which exceeds your policy limits. For the UIM insurance holder, any damages remaining in excess of the basic policy limit will trigger the UIM insurance, and the UIM will cover the difference between his or her UIM limits and the underinsured driver’s liability limits. UIM insurance typically covers the driver along with his vehicle. The insured is entitled to this coverage whether she is involved in an accident as a driver, passenger, or pedestrian. The insurance policies may cover family members related through marriage and or legal adoption. However, the primary insured may not cover any other family members who have purchased their own insurance policies independent of the primary insured. Passengers can also be covered under the primary UIM insurance policy; the insured must review the specific language in order to determine how UIM coverage can be applied. The requisite insurance coverage for all ensured motor vehicles, with the exception of motorcycles, in the Commonwealth of Kentucky is PIP. PIP, or personal injury protection, offers up to $10,000 per insured per accident. In order for the injured party to recover any medical expenses, the medical treatment for the injuries they sustained must be in the excess of $1,000. Assuming that both drivers, or driver and pedestrian, are both minimally insured, then the question arises is who is responsible for paying the PIP. Regardless of whoever is at fault in the collision, if a pedestrian or a cyclist is struck by an automobile, then the PIP insurance from the automobile involved in the accident is also extended to that cyclist or pedestrian. Kentucky Law provides that the statute of limitations for an action for PIP benefits is two years from the time the person suffers the loss of wages or incurred the medical bills caused by the accident. As mentioned earlier, if you are involved in an automobile accident in Kentucky or Ohio you run a 14% and 16% chance, respectively, of having to deal with a party who is uninsured. In order to protect themselves from such a scenario, many drivers purchase Uninsured Motorist coverage (UM). UM is offered as a standard on every insurance policy. It can, however, be waived by written request. Do You Need a Lawyer to Access Auto Insurance Coverage? If you have been involved in an accident and are attempting to make a first party insurance claim, it may be wise to seek legal assistance in creating your claim. Although they theoretically exist to work for your benefit, insurance companies are ultimately profit seeking corporations. It should be of no surprise that minimizing their corporate expenses may take precedent over satisfying your claim in full. It is not uncommon for an insurance company to either deny a claim or attempt to make a quick settlement which may not cover all of your expenses. As mentioned earlier many people find that the stress of attempting to make an insurance claim, with an insurance company who is reluctant to fulfill their contractual obligations, more stressful than the actual accident that they have recently been involved in. This is why it is important to ensure that you can properly negotiate your options and receive the full amount you are entitled to. One way of ensuring this is to speak to an attorney. 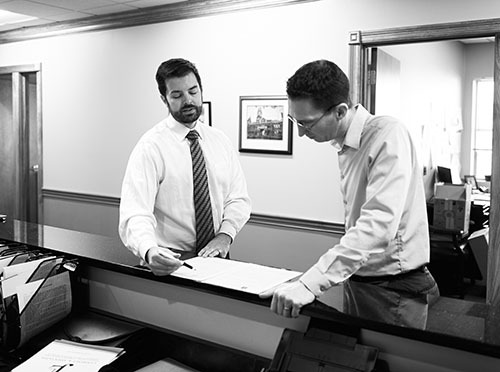 An experienced attorney will be able to navigate the complicated process and conduct favorable negotiations on your behalf. Have you been injured in a car accident and need help? We can provide the service and customer satisfaction you need. Call one of our attorneys for a free consultation today. We’re Working Hard for the Working Class, and we want to help you!